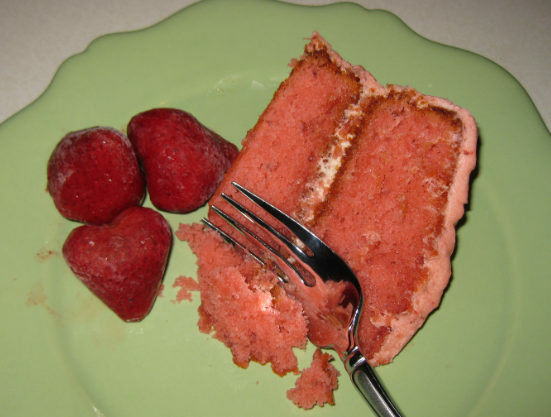 I kept thinking of this song by Paul Simon on Tuesday evening while I was icing a Strawberry Cake I had baked. I had baked this cake before and decided I wanted to bake it for our Maury Quilters’ Guild meeting on Wednesday. We were having a guest speaker and a potluck lunch. Everyone was to bring something and I had signed up for a dessert. My first wrong move was to bake a round layer cake instead of a sheet cake. Sheet cake….boring. Round layer ….pretty. Did I say pretty? It was more like…. interesting and labor intensive! I’ll explain. 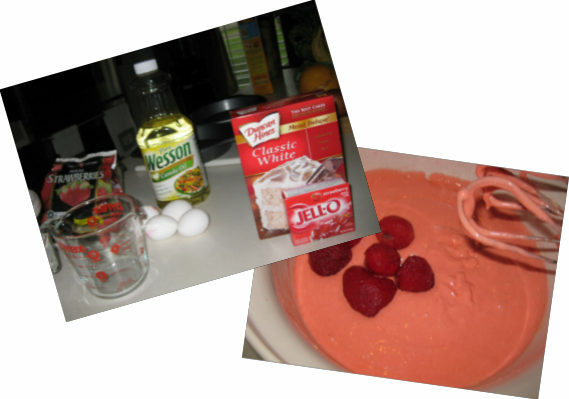 I put the white cake mix, eggs, strawberries, oil and water in a bowl and beat it up….I mean beat it. Poured the batter into two eight inch greased and flour pans. Set them in my 350 degree oven and baked them for 35 minutes. Good Dorine, you follow directions well. Pat yourself on the back. I let the layers cool, like a good little cook should. Perfect. The Guild is going to love this cake and think it is so beautiful when it’s finished, not to mention delicious. Next comes the icing….. Buttercream with added Strawberries. YUM. Remember I have done this before. One box of Confectioner’s sugar, margarine, frozen strawberries and vanilla flavoring. Then beat it to death or until it submits to looking like it should. You will be perfect… you will be perfect!!! Oh sorry, it just has to be perfect. 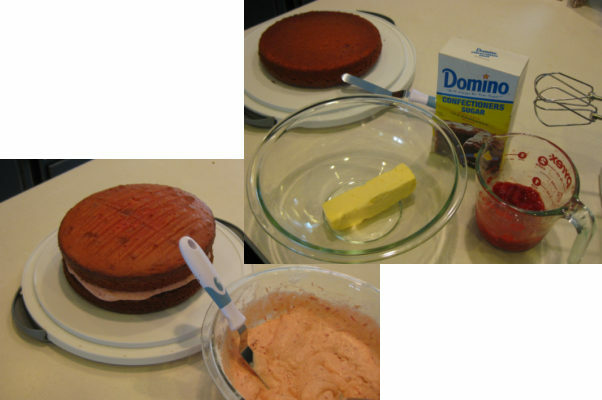 Next….I got my icing spatula and started spreading it on the first layer. Umm, looks delicious. Then I put on the second layer. Still looking good. Icing the top layer now. Still looking good. Now the sides. Done. Wait…..what’s happening. 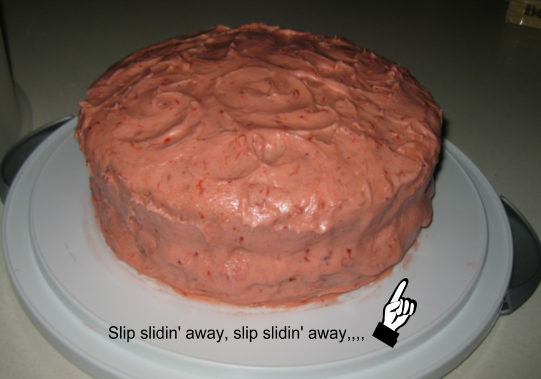 No, no, no…..it’s slip slidin away. The top and sides are sliding down into a puddle around the bottom. I tried to scoop it up and put it back on the cake but alas the same thing again. What did I do to this icing? I was sure I followed the directions but maybe, just maybe I did something wrong. Blame it on the humidity?? Hubby, hoping I would not to take it, suggested that I stop by Kroger and pick something up in the morning. That’s not me, I can’t do that and feel good about what I take. I had a Red Velvet cake mix in my pantry (not exactly homemade but close) so I decided to bake it and ice it in the morning. Okay, I had a plan so I could get some sleep. Wednesday morning when I got up, I checked the Strawberry Cake and the icing really hadn’t moved anymore. So I pushed the icing back up the sides and hoped for the best. Yay! Woo Hoo! It stayed put. It made it to the meeting and was a hit. It was delicious. I had some left over and was able to share it with Hubby and Awesome Son. It was enjoyed by all but I’m exhausted. Check tomorrow’s post for the recipe, if you dare, along with pics of the awesome quilts the speaker shared with us.